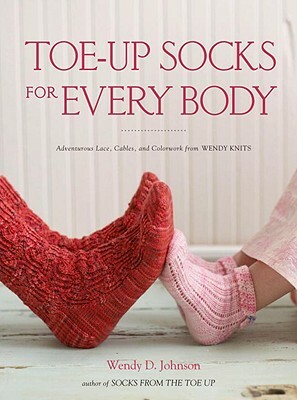 Acclaimed knitter, author, designer, and teacher Wendy D. Johnson is back with the perfect sequel to her hit book "Socks from the Toe Up." In "Toe-Up Socks for Every Body," Wendy shows knitters, whether they re knitting their first or hundred-and-first sock, how to use the toe-up technique to get the perfect fit. Not only that, she shows you that even seemingly complicated patterns are still knit just one row at a time. Go ahead Turn your favorite knee socks into thigh-highs. Knit that special someone classic argyles. Put even the wiggliest of toes in their first pair of lacey anklets. With Wendy's help, there's nothing you can t try from the toes on up. These 21 patterns cover everything from basics like materials and tools, to delicate lace, intricate cables, and fancy colorwork. Use these techniques and patterns to create beautiful socks for yourself and everybody in your life friends and family, young and old. With the lovely photographs, helpful illustrations for cast-on, toe, heel, and bind-off options, and all-around expert advice in "Toe-Up Socks for Every Body," you ll be a well-heeled and warm-hearted toe-up knitter. WENDY D. JOHNSON is the renowned knitter behind WendyKnits.net and the author of "Wendy Knits" and "Socks from the Toe Up." In addition, her work has been featured in many major knitting magazines. She lives in Alexandria, Virginia.